I profess… I am a gypsy. This was not apparent to me until last night, actually. One of my sisters sent me a link to an online test where one could discover who they were in a past life (What I Was In A Past Life). Sometimes I indulge in these silly tests just for fun. After all, what could it hurt? It might be fun to entertain the thought of a totally different life from long ago! And maybe, it could explain some quirky habits or characteristics I might have carried into my current journey on planet earth! With little hesitation, I answered each question on the quiz. They were simple, multiple choice questions, so I picked the first answer that appealed to me. My answers addressed current gender (in this life), favorite color, greatest fear, favorite school subject, and favorite number. I was asked for my birthdate and zodiac sign. I have to admit, I half expected the results to show I had been a philosopher, perhaps a healer, or maybe a person connected with nature in some way. So, when I clicked the last button and the website indicated it had calculated my answers, but then asked if I was still ready to view the particulars of my past life, I wondered, “Now what is that supposed to mean?” Was it so odd, difficult, or taboo that I might not want to see it? Oh well, I figured I could handle it, whatever it was, so I clicked the red button. Why not? The first trip to Wichita, KS to visit my nephew, Jeff. His mom and sister drove down from Nebraska the same weekend. At first, I discarded the entire idea. A gypsy fortune-teller? I was stymied! But my sister quickly reminded me there were some interesting connections to the gypsy lifestyle. Actually, it was not very long before I made the realization that she was onto something! I certainly have indulged in travel and capricious gypsy inclinations! Suddenly, I understood my absolute love and fascination with the 2005 release of Van Morrison’s “Magic Time” album, and more specifically, the strange pull I felt listening to the song, “Gypsy In My Soul”. When I first graduated high school, I managed to vacation outside of my home state of Nebraska a good bit. I traveled much of the United States for the next decade. I did not have a lot of money back then, but I managed camping trips to national parks and often flew to visit friends who had moved to distant areas in other states. These were trips I could take inexpensively, and yet fulfill the need to seek adventure and experience a little excitement. When I moved to Oklahoma in 1990, I continued to travel. By then I was making better money and was able to afford trips to larger cities and more upscale destinations. I was intrigued and fascinated by life in the various regions I visited, always striking up conversation with local people and gleaning much about their way of life. But in the period from 1998 to 2011, I did not travel as much. As many of you may have drawn from previous blog posts, I suffered with chronic depression. So the only traveling I managed during this time was a few business trips with FD, and a few trips he and I took for pleasure. 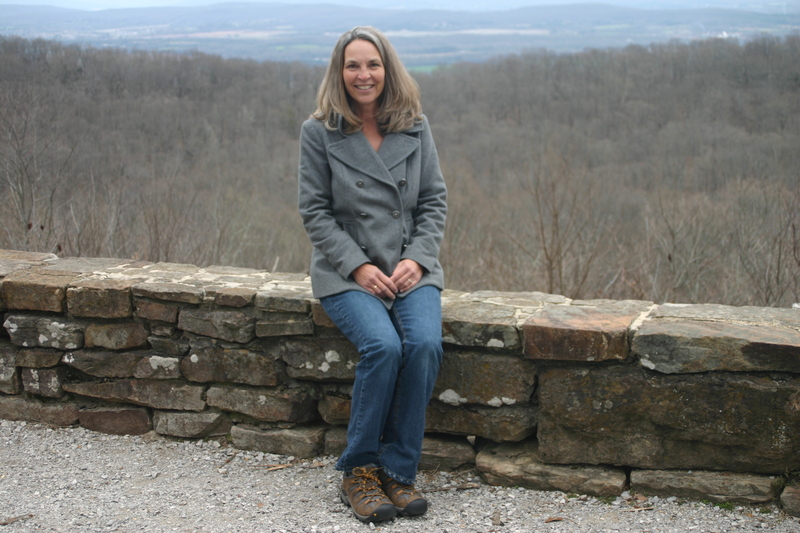 I felt safe and protected with FD, but traveling on my own became a thing of the past. I had lost my trust in people. Where just years before, I had been a traveling nomad, knowing no stranger and fearing nothing, I had now retreated into my shell to live much like a hermit. I knew I needed this time of caring for self, healing wounds, and protecting myself from further hurt. Try as I might though, I could not muster the desire to put my traveling shoes on again. Even a trip to the grocery store was a dreaded outing for me. Then, in October of 2012, something changed. 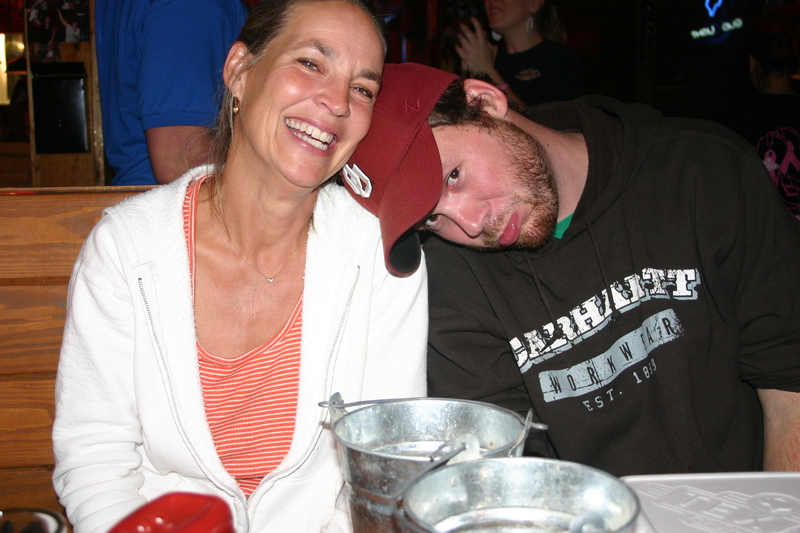 My nephew, Jeff, had just moved to Wichita, Kansas and I desperately wanted to see him. I had not driven a four-hour distance by myself in nearly a decade, but my desire to see Jeff overpowered my fear of making the trip. I worried mostly about fuel stops and encountering strangers along the way. What if I got fatigued and exhausted… what if I had a tire blow out, or a mechanical breakdown? So many questions of fear arose; my ego hammered me the whole trip. It was all needless worry. Not one snafu occurred. In fact, the drive went so smoothly, I wondered where the time had gone! I was proud of myself and I had a wonderful time! Sandy drove from Iowa to Muskogee, OK (to visit family). I drove across Oklahoma to meet her. Not two weeks later, another trip presented itself. I would drive by myself to Muskogee Oklahoma, nearly 3.5 hours from my home, to meet blogging friend, Sandy Sue from “A Mind Divided“. I was not nervous about meeting Sandy – but I was nervous about the drive. In my heart, I already knew Sandy. We had poured out our hearts and thoughts via our blogs and email for nearly two years. No, it was my fear of strangers and situations I might incur along the way that I was wary of. And, because of the driving distance and time involved to be able to visit, I would have to spend a night in a hotel, alone. But once again, I managed just fine. I arrived without a hitch, checked in at the hotel, shopped a bit, ate lunch and dinner alone in a restaurant, and went to bed early so that I could be up in plenty of time, ready to meet my friend Sandy, face to face! Sandy’s blog post about our meeting expresses the event quite eloquently, “The Intimate Strangers of Blogland“. Unfortunately, the five hours we spent visiting and connecting that day went entirely too fast. I found myself wishing she was my neighbor across the street, instead of a distant friend in far away Iowa. I drove home elated that afternoon, thinking how I would drive to Iowa if I had to but by golly, I was going to see Sandy Sue again… nothing could keep me from it! The barrier I had set up a decade ago was crumbling away and my traveling bone had risen from its ashes! 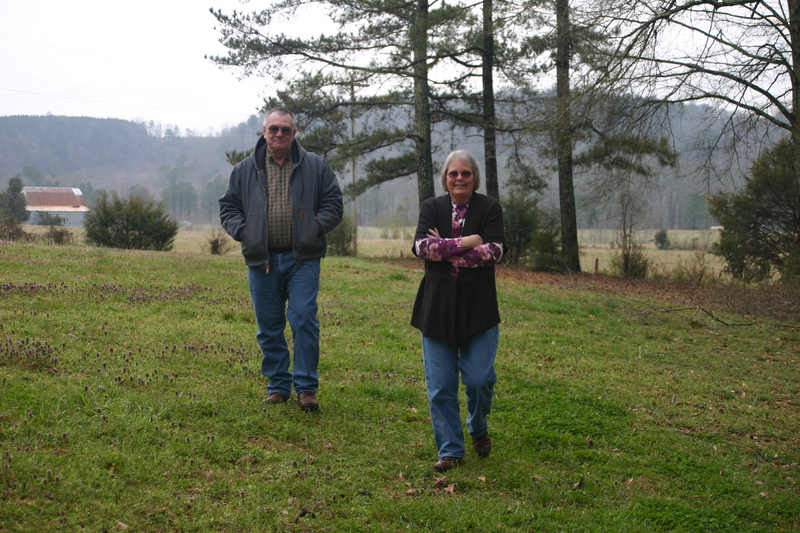 I got to see a lot of Alabama and Tennessee countryside while helping Bob and Lynda look at acreages during my visit. In February this year, I again made my way to Wichita to meet Jeff. This time we planned to carpool, driving onward to Nebraska for a weekend with family. That too, proved to be another traveling milestone for me. I was able to confront some personal demons and hurts from the past on that trip. Small steps to letting go, great leaps of liberation and freedom. For twenty-three years, I had dreaded trips back to Nebraska. This trip, the dread and anxiety fell away, much like the melting ice and snow we encountered that weekend. The winds of change had followed me into historically stormy territory. But the warm sun was shining on me now! The Wee Choos were my wake-up alarm every morning. 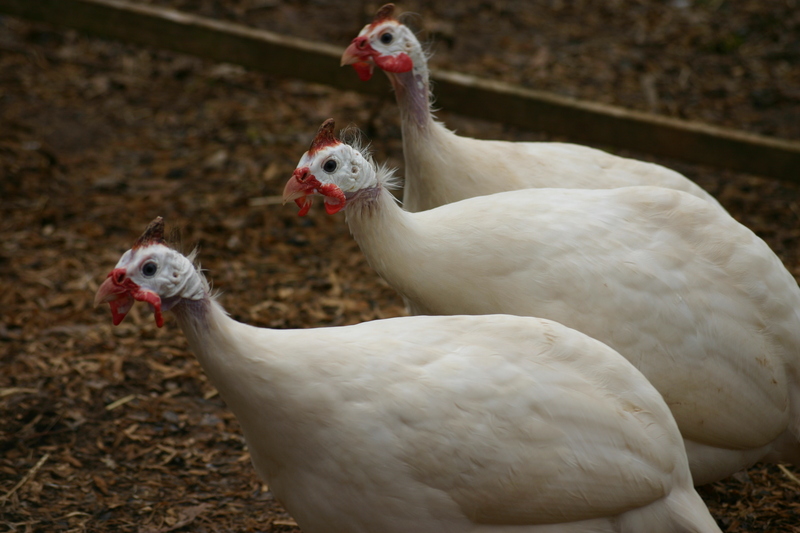 If that didn’t work, Lynda’s geese began honking shortly after the guinea hens began calling! Just after returning from the Nebraska trip, I got an invitation to visit another close blogger friend, Lynda, from “Life on the Farmlet“. Lynda and I had not only shared blogs and emails over a two-year period, but we had also visited over the phone. 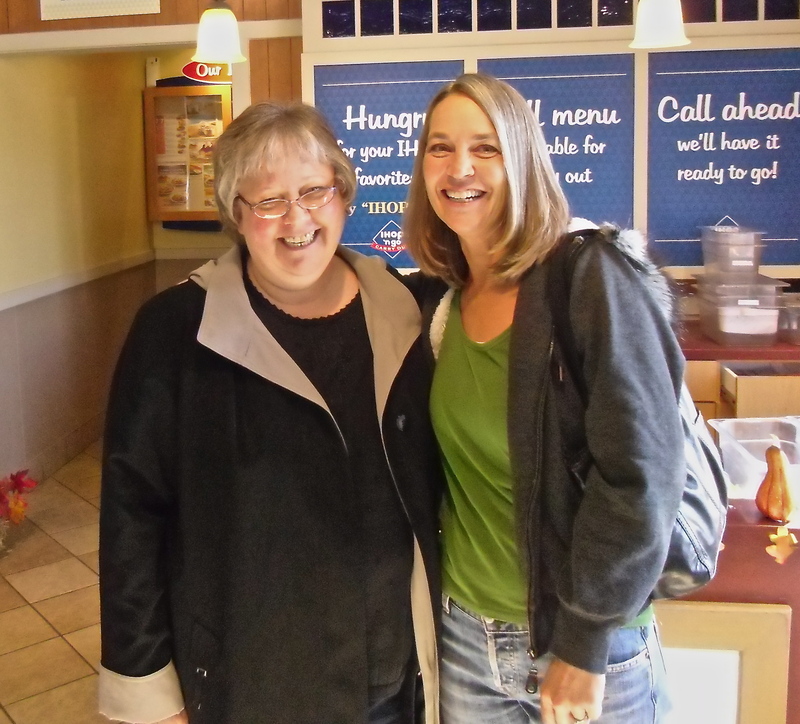 Lynda had been my friend from nearly the start of my blogging days, and had encouraged me all along the way. So, early this spring, I made the arrangements to fly to Alabama in late March to meet Lynda and spend a week with her and her husband, Bob, on the Farmlet. Other than some fear of airport security protocol and not knowing what to expect without FD’s help, I was excited about the trip. Hilariously, the only issue that presented itself was that Lynda and I did not recognize each other at the airport (even though we kept looking right AT each other). Had she not mustered the effort to call out my name just as I passed by, we might have missed each other! The weather was cold during my visit to Alabama, but that didn’t take away from the beauty of the landscape. I fell in love with the distant Appalachian Mountains. Perhaps my sister (also known as Princess Josaphine in her previous life) is correct about my gypsy ways. I think it is a good sign that, after a long, dry period of being rooted in one spot, I am back in my traveling shoes again. I just needed time to heal. I needed the gifts of medicine from Daisy deer and all of the wildlife here on the ten-acre ranch, to help me work through my troubles. And I am thankful that FD, my family, and a few special friends, loved and supported me through my hermit time. I do not know where the gypsy winds will blow me next… but with these strong, springtime, Oklahoma gales gusting away, I’m thinking I best put a couple of rocks in my pockets! 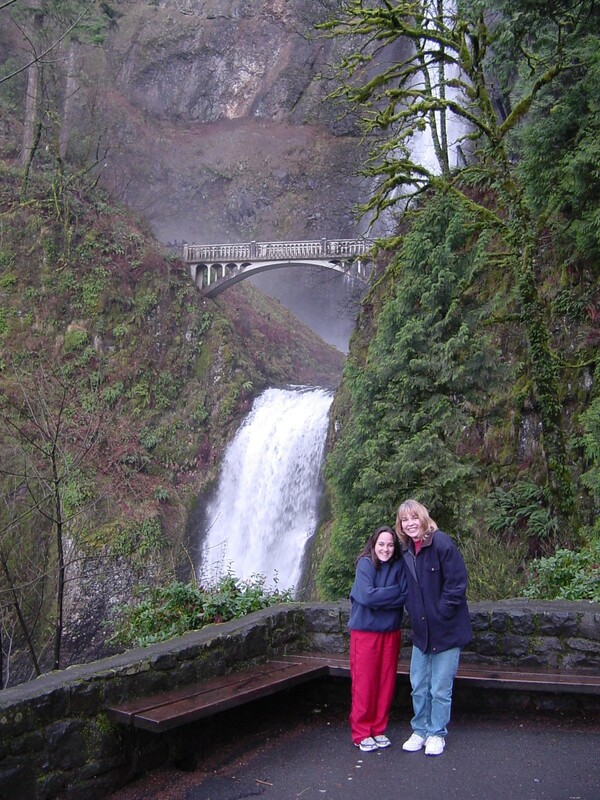 FD (the photographer), niece Kati Jo, and I taking in the view at Multnomah Falls, along the Columbia River in Oregon. FD and I dine at a favorite French restaurant on the pier at Marigot in the French West Indies. That is our CRAZY French waiter in the background! St. Martin is our favorite vacation spot in the world. Food and travel just seem to go together! FD and I love to take in the local cuisine wherever we travel. FD and I enjoying an Eastern Caribbean cruise to the US Virgin Islands and the French West Indies. 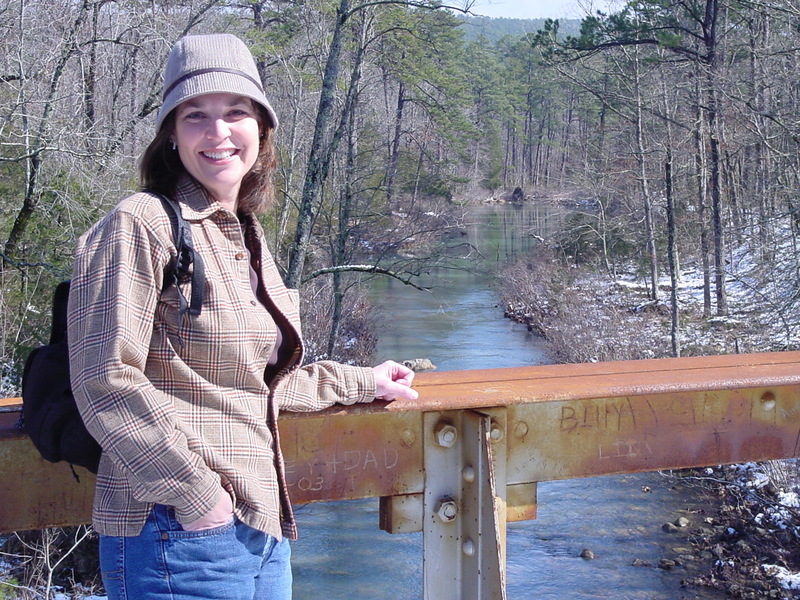 Hiking in the Ouachita Mountains of Arkansas. Most of my life I’ve been drawn to the outdoors and nature. 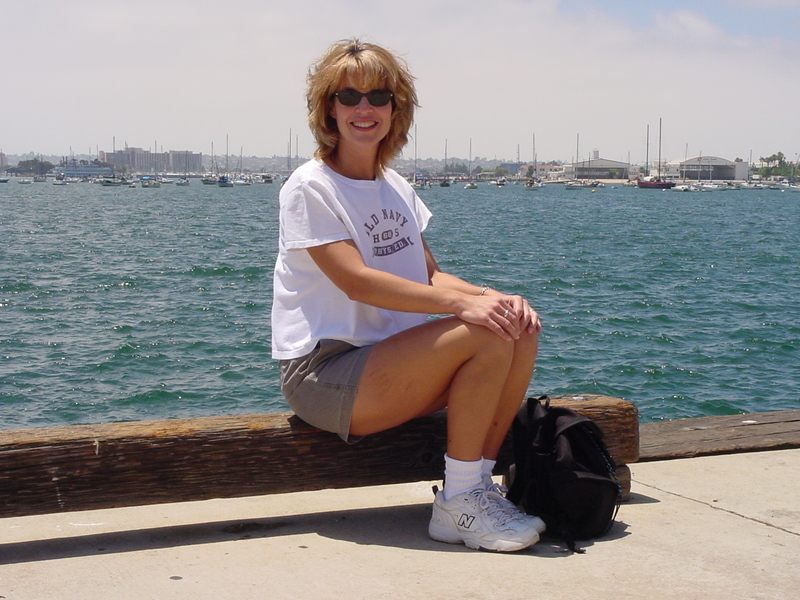 Back in 2001 on the waterfront at San Diego Bay. Yes, I was a blonde for a while! 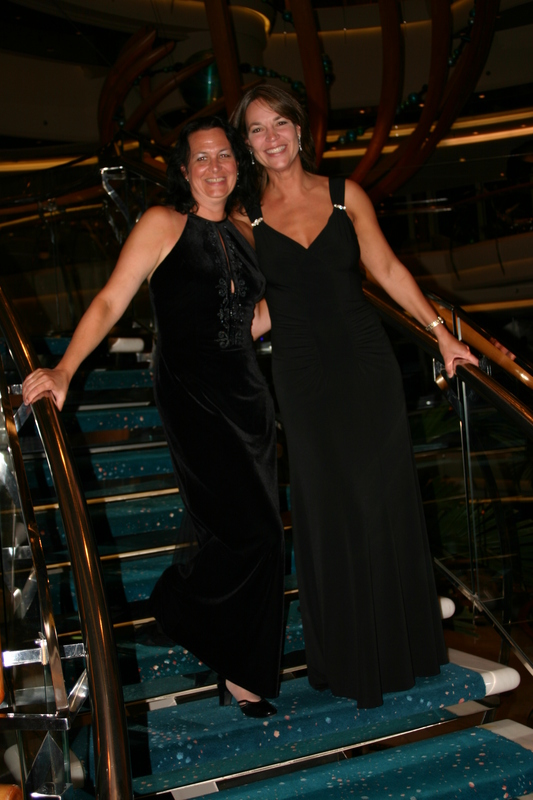 FD’s Sissy Jo and me on a Western Caribbean cruise in 2005. 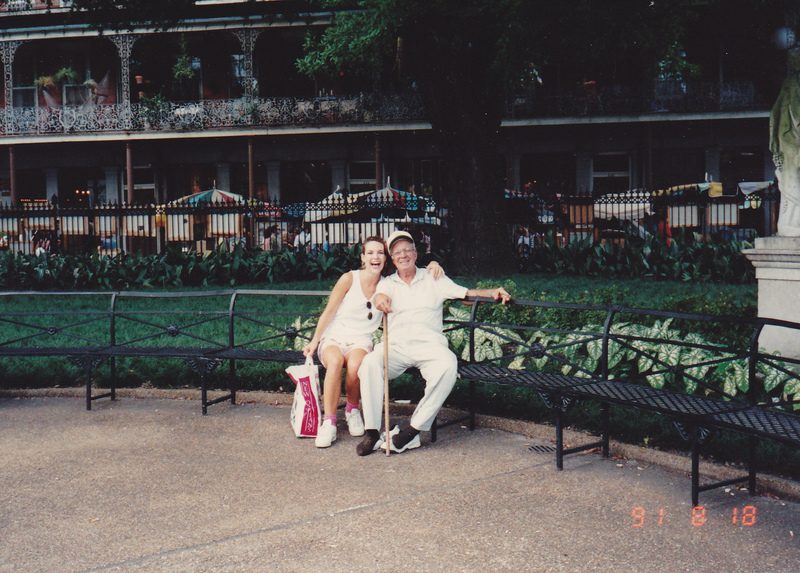 I traveled to New Orleans many times to visit Uncle Jewel. I never could fit in my clothes on the way home… I enjoyed too much great Cajun food! Wonderful that the gypsy fire has been rekindled! Your smile in these photos is so full of joy! Thank you, Kat! I love to travel… those are happy times! How funny. Well, it was just a test to try for fun, but it did prompt me to think about the gypsy bone I possess in this life… and I’m happy of it! Great blog. Glad I found you. I too had exactly the same reading from the online test. “city of Ankara around year 1884” was what I googled to find out where that was and here I am. Your reading was identical to mine. Too much fun! Stay well safe travels. Thanks Michele! I am glad you found me too! It’s always great to meet like-minded people! It was a fun post to write, and the little test really got me thinking about my gypsy tendencies all of my life. I do travel when I can! yep, I went to the same website and it told me the same thing. I too took the past life test and was told that I was Eleona Baltimor…what a crock! I don’t want to burst your bubble, but when I filled that test I was this gypsy Eleonora too, so we both can’t be the same person. Although I had fun taking that test. I just took the test myself and got the exact same thing. Awesome photos! Everyone experiences great memories while traveling. Traveling is something we all need to do in our lives. I agree Nathan! I would say my best memories have been of trips and vacations. A wise friend once told me that everyone should get out of town at least once a year… even if it’s a trip just 50 miles away. I think travel is good for the soul! “…my traveling bone had risen from its ashes” — just like a Phoenix! You’re off on a good start to making up for those home-bound years, that’s for sure. It’s so nice to see so many happy pictures. And by the way, you have a wonderful smile! Oh thank you Kim!! Traveling has always been a positive experience for me. I’m sure looking forward to indulging in a gypsy lifestyle now that I’ve found my traveling shoes! I’m so glad you are getting your travelling shoes and confidence back 🙂 There will be no stopping you now! Thanks Rachel! It’s such a good feeling to be back in those traveling shoes!! I believe we have lived many past lives, and I do feel there are connections from life to life. This was a fun post to write, and for me, a realization that we are so much more than we see superficially sometimes. The term gypsy can carry negative connotations in some regions, but I’ve discovered, for me, it is a wonderful aspect of who I am! I have updated the post to include the link to the past life website in the first paragraph! I’d be interested to see what your results bring! You were a fortune-teller in your previous life. In your previous life you were a scientist, a biochemist and a mechanic all in one. You worked on the development of new kinds of medicine for a biomedical company. How much fun has this been? It’s been interesting to dabble in what might have been – maybe a connection with something we are familiar with. Thanks for sharing your results! Hi Sharon. I have had several people comment that they got the same information I did on that website, and that was expected. It was just a fun test that got me thinking about how I had been a traveling gypsy at times in my life = the desire to venture about and see the world. I have participated in regression therapy and find it fascinating and helpful in this life. I only had an experience with a card reader once and was amazed that as time went on, this young man was quite accurate about future events that occurred in my life. Astrology is something I know little about but am intrigued by. All of these facets of life are intriguing to me. Thanks for commenting!! Can you link the quiz address? It would be fun to see what other people get too. I can’t believe I didn’t think to add the link! It is now added to the first paragraph so that you may discover your past life! Have fun with it! I love that you have found your wings, and that you are comfortable to travel again. I’m so happy my trip to visit you was part of my return to gypsy travel! And yes, you ARE a fabulous cook! You gave me new ideas to incorporate into our already healthy diet. I marveled at your “no fuss” approach to meals… using what was on hand, and not stressing over little details. I tend to worry about meal planning. 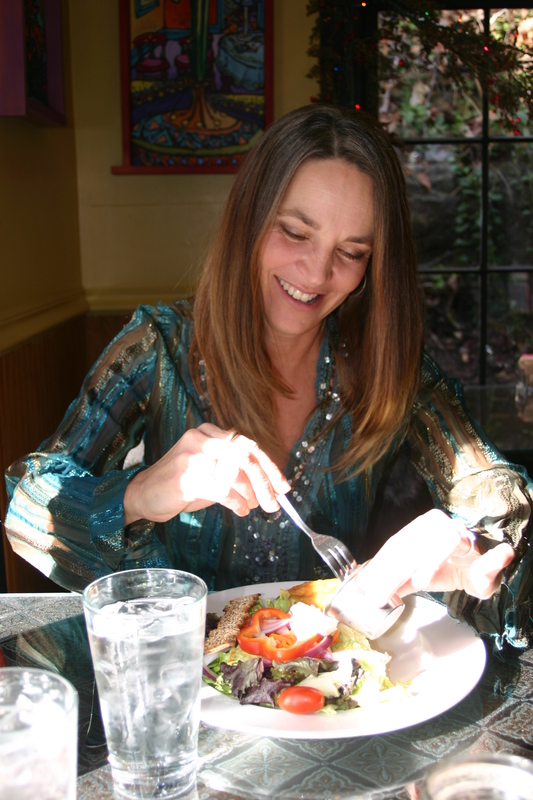 Again, observing your calm approach and incorporating gluten-free and diabetic changes to diet, enlightened me and offered new options and ideas for preparing meals! I loved this post with all the photographs of you! And now I’m intrigued …. could you post the link to your past life quiz? Thank you Margaret! I have updated the first paragraph of the blog post to include the link to the past life quiz. You’ll have to let me know the result of your test! Great post and pictures. You inspire some serious thoughts of hitting the open road and exploring, which I haven’t done for years. Thanks for the tempting reminder. Thanks 1daughter! I think sometimes a short day trip is a good idea just to get a little travel fix from time to time. Travel is my reward for working hard all year long. It’s one of those indulgences that really brings me joy! Lori, I went to the site for fun to see what I would be, but there is a flaw in the test. They left out Taurus, and there is no contact link to request them to fix it. Poo… I guess I’ll never know now. LOL! Oh no!! Perhaps Taurus people are a primitive people and haven’t had past lives! LOL Just kidding. What a bummer! Sometimes the soul travels when the body is unable. Or one or them needs to go alone to accomplish something? Isn’t it strange what a community develops amid blogs? Go on to travel free – both of you! What a lovely comment! It’s true that outdoors and nature is healing. Oh, I know… I have always been drawn to the sea. I guess that I am a water sign – Cancer the crab, I always feel that pull to the islands. How did I ever end up in a land-locked state? 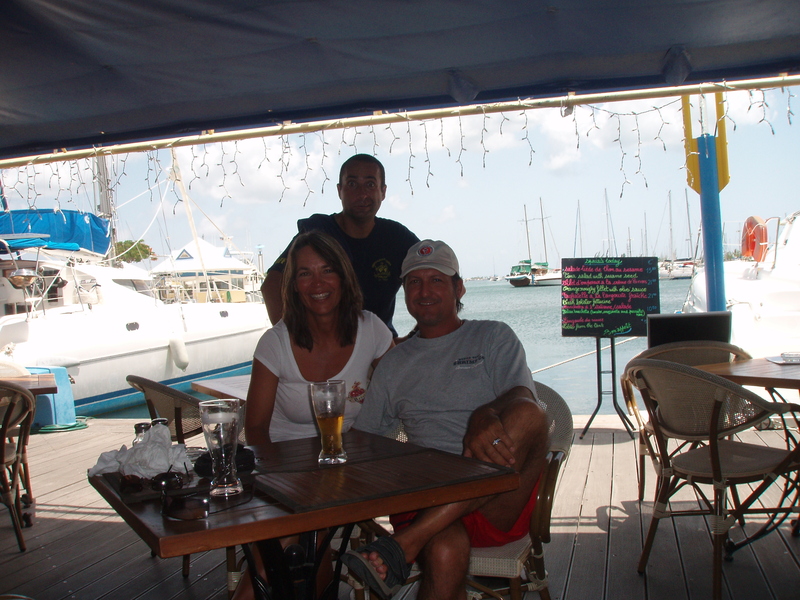 The last time we vacationed two weeks in St.Martin, I cried when we had to come home. Too bad being a beach bum doesn’t pay! I’d be a good one! I feel/react exactly the same way about mountains. Close to coast and by water – good, but mts are better. The Virgin Island have both! I agree! Best of both worlds! Today’s blustery and cold weather has me wishing I was in the islands! BRR! This just makes me happy. You were made to roam, girlfriend. I’m so glad I was part of your coming back to this important part of yourself. And, BTW, you are stunningly gorgeous in these pictures. Thank you Sandy! I’m so glad you are a part of this journey for me… one of those friends who supported me in finding my way. It’s good to be back in my traveling shoes! You know, I laughed when I looked through old photos of my travels – I seem to have had gypsy tendencies with my hair color!! I noticed I tried just about every shade of the color wheel! Wow, once again your post painted pictures in my head as I read it. You are one remarkable writer, S. Dog and I really enjoy reading your posts. I’ve often given thought to my past lives – not as in fortune telling but through my ancestry. I have a very scientific type, ordered mind and have a hard time buying into fortune-telling with the exception of its entertainment value. With that said, the “Ogden” name is from the Midlands of England and thought to be Scandinavian in origin. This part of England is the same area that “Robin Hood” was based and is also the area used by J. R. R. Tolkien to base his region called the “Shire” in his “Lord of the Rings” trilogy. My family shield says that Ogden means “OAK DEN,” perhaps explaining my love of the woods and the Midlands are still thickly wooded with primarily oak/hardwood type forest. All in all, it’s a fairly freaky place as that is also the home of the ancient Druids, lol. Anyway, thanks once again for the entertainment. I really do think that you could be a writer and perhaps short stories could be your thing. You are really very good at writing a compelling story in a minimum amount of words. Thank you Louis, what a lovely comment! I took the past life quiz just for fun, but it was valuable in the sense that it caused me to make a realization about a facet of my life, recently rediscovered. I am glad you were able to relate to it as well. I believe philosophermouseofthehedge said it well, “Isn’t it strange what a community develops amid blogs?” When we write about a subject it is always interesting to me to see what kind of conversation results. I have given more thought about your writing and am thinking short stories and children’s books. Imagine writing stories about Daisy for children – too cool! I went back and tried to take the “past life” test but I answer the 1st question “male” and then it doesn’t go anywhere. Maybe it doesn’t like guys, lol. I wrote myself an email to try it again! Well, thanks Louis. You know there is so much to publishing a book. I love writing, but I get overwhelmed thinking about all that it would entail to actually publish a book. Sorry the past life test hasn’t worked for you. It was just a silly test, but it helped me realize a part of me I hadn’t thought about in a very long time. Awww- I love your story and I am thankful that you have reconnected with your Gypsy spirit! Time for me spent traveling and spent out-of-doors has always been inspiring for me as well. I am just starting to *try* and put down roots, and find a good balance between the two lifestyles. All the best! Oh, thank you so much! I know you’ll find the perfect balance! Just follow your spirit and let your feet roam every now and then… being rooted has it’s benefits too though. Best wishes to you also, my friend! Those traveling shoes seem to fit you perfectly, and I do hope they bring you my way sometime soon, LOL! You have done well, making those initial BIG steps to do some traveling by yourself; I’m proud of you! I love to travel, but I have to admit, the thought of getting on an airplane by myself (or just an airplane, period! ), or traveling great distances alone, would scare the bejesus out of me! Love the vacation photos of you; you are a beautiful soul, inside and out! Thank you Baby Sister! 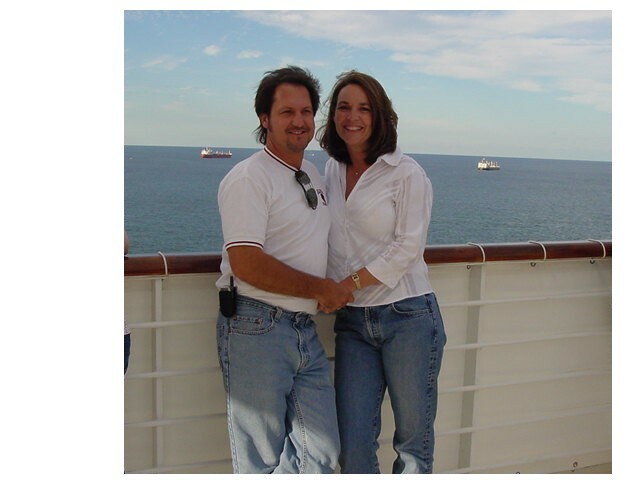 We’ve had some trips together too… back when I was a much younger “gypsy”!! Oh, what fun times those were. I am thankful for all of the wonderful memories of my travels, and the adventure they brought me. I’ve had so many great opportunities to travel… and I’m so glad I took advantage of that! What a glorious, positive, hope filled happy post! I am SO happy that you have found your inner gypsy again and that you are feeling able to step out into nature and feel that glorious rush of new places once more :). I LOVE this post :). Of course F.D. was there to wait for you at the end of your tunnel, you are well worth it girl :). Oh, thanks SO MUCH Fran!! I had a feeling you might like this post! Your carefree and adventurous nature inspires me! Gee, thank you for all of those smiley faces!! AWESOME! I did the same test and it came up with the same answer. How many people could have been Eleona Baltimor? Thank you! It was a fun post to put together! Thanks for letting me travel with you. I like your lovely pictures and your post. These are great souvenirs for you. Perhaps the gypsy winds will blow you next to what we call “the old continent”? I hope so. I wish you a nice and sunny day. It is a beautiful day here… very little breeze and the warm temperatures are returning! I love the spring time. I hope too, to do more traveling abroad. FD and I would love to visit our ancestral lands someday. For now our commitments are here, but I see us partaking in more travel when FD retires. Heh. I was apparently a knight, Lori. A strong-minded knight from Southern Germany who was given land by the king and who lived a peaceful life on a farm for 18 years until I died at age 54. I’ll have to mull that over a bit! I’ve met one fellow blogger, surprisingly only once. We’re neighbors, in the grand scheme of things, and both spend time on the trails at the nature center fairly often. As you know, I’m likely to meet another fellow blogger at some point – at least, I hope! Great stories, Lori. How’s everything on the farm progressing? Oh, my, what a knoble position! Of course you died a little young, but then my gypsy days didn’t take me on much longer of a journey! LOL Perhaps our paths will meet someday! A person just never knows about that… and since I have my traveling shoes back on again, who knows where the winds may take me! Everything is going well here… I guess. I was moving right along with spring until recently… if I can just get my next blog post finished, you’ll discover why I’ve had to pull back just a bit! In your previous life you were a scientist, a biochemist and a mechanic all in one. You worked on the development of new kinds of medicine for a biomedical company. However, your inventions were not revolutionary enough to make you well-known all around the world. Despite this, you had a very high IQ and you were also a pretty tenacious person. You were born in Washington in 1890 but due to your father´s job you had to move to New York when you were sixteen. You were brought up in a decent family and you had two sisters. Because you had a high IQ in you previous life, it is possible and predictable that you also have a high IQ today! It makes me laugh because I am indeed a scientifically minded person! How funny! Well, I’m glad it finally worked for you! I doubt the validity of the whole thing, but it was fun, and it did help me to reflect on my gypsy ways! I agree Sara, they are just for fun. However, it did prompt me to think a little harder about the varied personalities we are as individuals. I kind of like being a gypsy… even if I wasn’t in a past life! This is interesting because I did the same exact test and my results are like yours word for word. On my father’s side they are Romanichal Gypsies. I know a little about their culture & can speak some of the language. My brother was the true gypsy in our family. Another test I took said I was a philosopher in Romania in 1200. That was interesting as well. It was a fun quiz, but it really did get me to thinking about how I had been a gypsy at times in my life! I think being a modern day philosopher would be awesome! I’m not sure how many of us there are now! How funny. For me it was more about the idea of being a gypsy and not realizing until I pondered the thought, that I have been much like a traveling gypsy throughout my life. It made me happy to think about. Thanks so much for visiting and commenting! It’s just for fun… the test doesn’t really mean anything but it did get me to thinking about my gypsy ways! Great article and wonderful photos! I found you because I googled the whole fortune-teller thing I got as an answer to the online test. I see that you also travel a lot, just like me.. actually the fortune-teller “past life” was an interesting answer because I led a gypsy-like life while growing up. I’m an army brat, I went to more than 10 different schools while living in different cities (my mom used to say we were living nomadic lives) so I developed a penchant for traveling. When I was 19 I traveled throughout Europe for a month and a year later I came to Paris to learn French and that’s when I met my hubby, at Notre-Dame de Paris, which was the oddest thing ever because the The Hunchback of Notre-Dame is one of my favorite books!! And yes…there is a gypsy in that book! Hi Melissa! What an interesting life you are living! Being an army kid would have posed some problems for most people but it sounds like you did well with your experience, and managed to continue your travels and adventure as a young lady. How cool to have met your husband as you did, and I take it that you live in France now(as your yahoo address indicates)? Thank you so much for sharing about your gypsy ways! It’s always wonderful to meet a kindred spirit… or should I say free spirit? Ha ha! No disappointment here… it was all for fun! There must be many of us gypsies running around in the world! Glad to know another kindred soul! Yes, many of us got the same results. I was just making the point that the whole thing brought to mind the gypsy in me. It was fun to think about. I was Eleona Baltimor too…..Is there any common facts between us? My present name is Eleni!! i just finished answering the same test and surprisingly, i had the same result. were we a same person back in our past lives? I just took the same quiz last night and had the same answer. I thought how could I have been this person!? So I googled it and found another people who received the same answer as us! I think to find out truly who we once were we need to seek professional help like maybe a gypsy or fortune teller. 🙂 it’s a very interesting topic and would indeed love to know how old my soul is. I too took the ‘test’ and was Eleona Baltimore. .
Don’t believe I have ever seen so many photo’ of you, in each one you appear to be just bubbling over, and that is nice, so refreshing. FD is a fortunate pilgrim indeed. How fitting was that video?! Even though I wander to the river more these days than travel to far away places, I still feel as a little nomad – happy to travel about. Isn’t it lovely when we “bubble over” and our countenance reflects that? Thanks, Don. I just got the same answer to that test. I found your post by searching Eleona Baltimore. Yep, Eleona Baltimor here too! Gosh I was also Eleona Baltimore in a past life also in the same test. Looks like she had multiple personality disorder. I am too the exact same past life person ~ the jokes on us!! I got the same result, and when I looked up her name, I saw this website. Hi, I had the same story as urs in the site. same person !!!!! !